Lock Up Valve, YT-400 sense the main supply pressure and shuts down the air flow when the pressure is lower than setting level to avoid system shutdown or damages to pipelines. - Due to its compact size and light weight, lock up valve can be installed without a bracket. 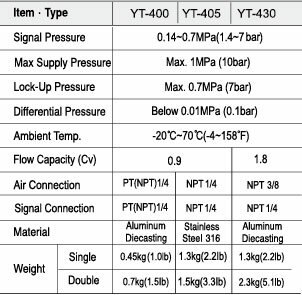 - It responses to less than 0.1kgf/㎠ pressure change/s. - Epoxy power coating resists against the corrosion. - 100 mesh screen filters small dust entering into the unit. Reviews For Lock Up Valve 1/4"